I've just spent the last few days at this year's Brooks and District Chamber of Commerce Trade Show. 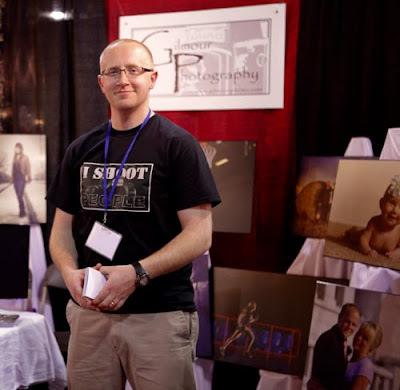 This was my first time that I've had a booth at a Trade show and I really enjoyed it. 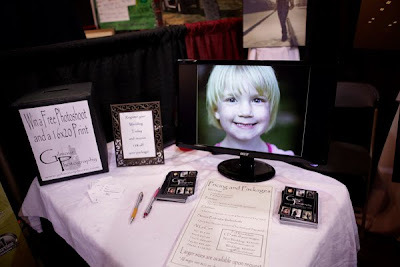 I met and talked to well over 450 people and had 423 people enter my draw for a free photo shoot and 16x20 print. I originally planned on giving one prize away this year but due to the number of people that entered I have decided to give 3 way. I drew the names today and have a video of the winners at the end of this post. I was fortunate to be located in the show by some other great businesses such as Frontier Signworks, 2nd Floor Hair and Body and Meadows Golf Course. They were all very energetic and talkative. This was a nice bonus during the slower times. It was also able to talk to a few people that I haven't seen I a while as they cam by my booth. It was great to catch up and hear about what was new in their lives. Life goes on and people get busy. One of the most common things I heard was that it had been several years since people had done a family picture. If you look at your last family photo that you have up on your wall and see that you still had hair and are now bald you need a new one. If you see in the photo that your oldest child is wearing a diaper but in reality is old enough to drive your car now... you need a new photo. Finally, if you've had any new addition to your family or have started your own family you need a current family photo. Meeting 450+ people and having them see my work... Awesome! reconnecting with some friends... Great! Made some new friends... Sweet! Standing on concrete for 18 hours... not so good. Having my son come hang out with me for an hour and help pass out cards... Highlight of the weekend! I realized after I finished recording the draw that the one woman's name is actually Nikki not Nuki... sorry Nikki.